As we reported earlier this week, MTV began covering the West Coast rap scene during their “New West Week” news special. The weeklong coverage was set to run for four days and highlight the best up and comers. 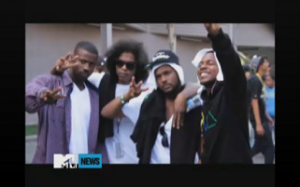 MTV introduced Black Hippy to its television audience in a short news segment that featured music from Jay Rock and Kendrick Lamar. In speaking to MTV, the group discussed their success, their touring, Dr. Dre’s involvement, and the solo releases coming out from the TDE camp. MTV also followed the group to their humble home studio where all of their material is created. The MTV segment is a great watch for fans who are not yet familiar with the unique and incredible music coming from Black Hippy.